The early morning hours is our ‘’golden hours’’. A lot can be done before we start the day. Oil massaging, drinking lemon water, dry brushing, meditation / praying and a quick morning workout are all examples of how we can start our day healthy and set the tone for the rest of the day. But the Japanese recommend us to add one more very healthy habit, the Japanese water therapy. For decades the Japanese have been practicing the habit of drinking water in the morning on an empty stomach. Drinking water is of course generally good for our health. Water is a great source of vitality and is a necessary element for every cell and function in our body. There is no life without water. Many scientific studies and research is going on for years on the effects of drinking water on human lives. Now what do you understand by Japanese water therapy? Japanese traditional medical system recommends drinking water just after awakening because of its natural health benefits. 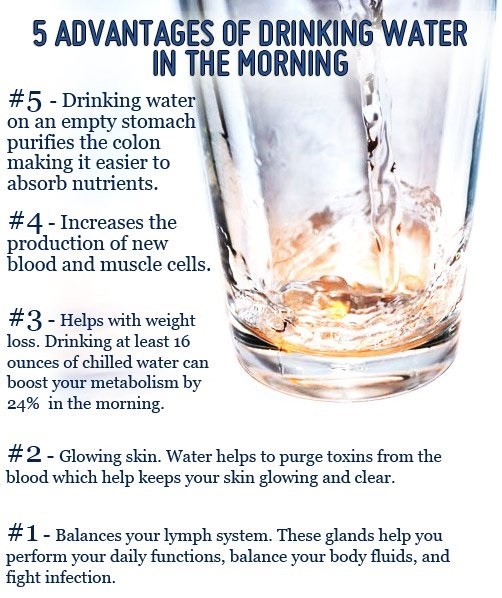 For decades, it is a well-known habit in Japan to drink water immediately after waking up every morning on an empty stomach although no studies could be found on it. What precautions to take before we start practicing the Japanese water therapy? If you suffering or have any kidney problem or other severe health issues, then take your doctor’s advice before starting the Japanese Water Therapy. Now we come to the steps we need to follow to carry out this therapy. After we wake up we should drink 4 x 160ml (22 ounces) glasses of water not cold before we do anything else, including brushing our teeth. After we finish our water, we can brush our teeth, but eating or drinking for next 45 minutes is not allowed. After 45 minutes have passed we may eat and drink as normal. After every meal or snack, we should not eat or drink anything for next 2 hours. If anyone is sick, elderly, or not used to this habit, one can start this process gradually that eventually after some days will consume 22 ounces water per day. It is suggested to continue this therapy and to make this procedure a routine in our life. The Chinese and Japanese usually tend to drink hot water with their meals, not cold water. Maybe now it’s time that we should also adopt their drinking habits? In Ayurveda also there are also many suggestions on the temperature of drinking water. They believe that drinking liquids too cold or too hot can cause many diseases. Now why should one believe this Japanese practice? There are some remarkable facts which convince us to adopt some of the Japanese healthy habits. Japanese have the most longevity life as nation and there are quite a number of Japanese men & women older than 100 years. Japanese water therapy, similar to the water therapy in Indian ayurveda, has been around for a very long time. In fact, the Japanese water therapy is extremely popular not only in Japan, but throughout the world. We all know that our bodies are made up of 60-70% water so when the amount of water in our body reduces, we face different health problems since our organs can’t function without water. We should never overdo this water therapy. Drinking excess water in a short time can lead to what is known as “fatal water poisoning” or affect our kidney. Now the level of excessive water depends on factors like age, person’s fitness level, weight, climatic conditions etc has to be taken into account. Too much of a good thing is also not good either, and this certainly goes with Japanese water therapy as well. So some conditions & precautions are to taken before we go for Japanese water therapy. My followers on GPLUS would really like your blog. May I promote it to them?